As I am sure you know the new season of The Farmers’ Market on The Terrace had kicked off last Friday. To me, this is Dubai’s best season, not only because the weather is fantastic and we get to be outdoors, but also because this is the season when food is that much more flavoursome as we get plenty of gorgeous local produce that is packed with flavour. The salads suddenly become gorgeous, the herbs are pungent and we get a chance to choose eating seasonal and support local produce and farmers. What more could any foodie or home cook ever ask for? I for one am making best use of this seasonal offering, and right now purchasing products to prepare a wider range of my Organic Mooneh for you. I am working on new pickles, sauces, condiments and confits with what is in season and each week’s growing list of available produce. 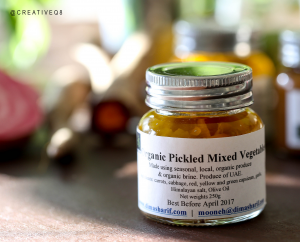 This is the whole point behind my MOONEH range of products.. it is mostly to support local organic farming and the farmers, by making best use of this gorgeous seasonal local and organic produce. Preserving this produce and providing you with amazing condiments and everyday cooking essentials that are not just good for you but also help you cook and serve delicious food to your family and guests without putting in the extra hours should you not have the luxury of time on your hands. Since the season had just started, most products are in the making, however, I do have some great products available which you can order online here, and we deliver to you. I also sell these products every Friday morning at The Farmers’ Market at Bay Avenue. While my line’s priority is local produce (I love supporting the local farmers), some produce is not available locally, such as olive oil for instance. Such produce I purchase from my family farms in Jordan, and if not available there, then from this region’s best artisanal producers that I personally pick. Any such produce that is not sourced locally I purchase from the closest proximity, and with so much love. I usually sell some to support a cause (simply for love). Therefore, the profit from some of these regionally sourced products will go to support a cause and you will see which causes I am supporting below. Check out the products and their descriptions on this link. Please note that these are all updated regularly, the list grows and shrinks depending on seasonality. 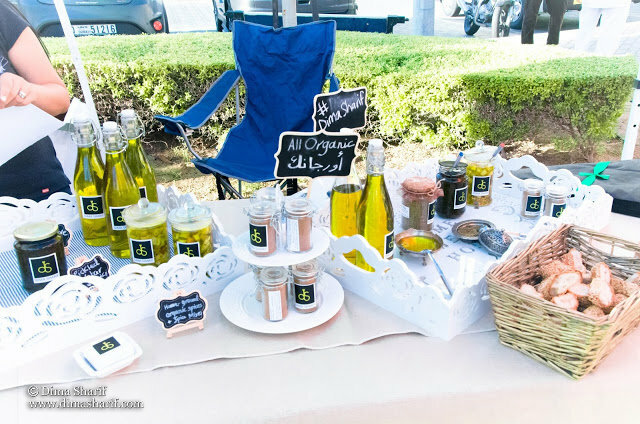 I have available my fantastic award-winning, certified Organic and Extra Virgin Olive Oil, which is the produce of Jordan, from my family farm that grows Nebali olive trees. Many of you have already tried my olive oil and have given me amazing feedback. If you still haven’t tried it, you really must, drop by this friday and try it, because it really is an outstanding olive oil with 0.5 acidity (very rare to achieve, most of the best olive oils are of 0.8 acidity!). This outstanding and very limited edition olive oil (1000 (500 ml) bottles in total) is fruity and lends that amazing flavour to any food you drizzle it on. Fish is fish, labneh is labneh and hummus is hummus but once you drizzle this oil over them, you serve an outstanding flavour and no one will even think it is so outstanding because of the olive oil! This is exactly what I have been telling you all along: it is all in the quality of the raw ingredients that good food happens. And this is just a testament of that! Since this produce is not locally sourced and therefore is not one supporting the local farmers as my other locally sourced products, it is a DS product that supports a cause. 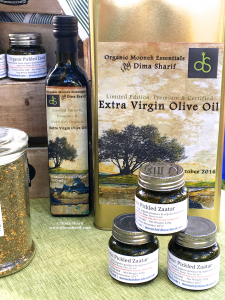 The profit from this Olive Oil along with that from my Organic Dried Zaatar Mix will go to support up to 5 single-mother Palestinian families living in the Palestinian Refugee camps in Jordan. What is food if it does not have soul? And what is soul if it does not have love in it? To me, this is the one product of mine that has the most beautiful story. The fresh zaatar (organic produce of Jordan) is hand picked by Palestinian women living in the Palestinian Refugee Camps in Jordan. The women then pick the fresh zaatar leaves off the stems, one-by-one and by hand. The leaves are then washed and dried to then be rubbed by hand and preserved then mixed with the toasted sesame. The whole process is carried out by hand, by these women and managed by my amazing grandmother, who makes sure it is done following our ancient family’s method! 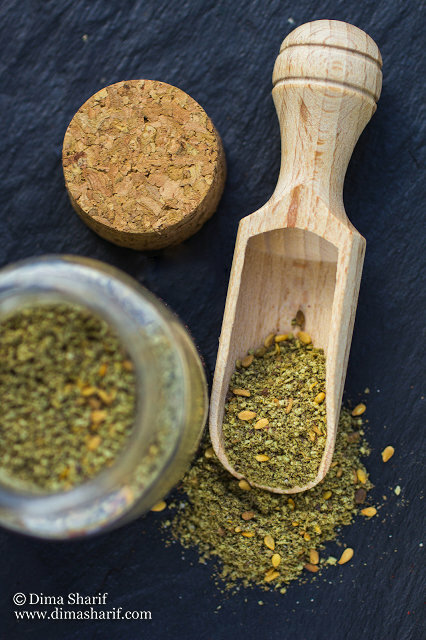 This Zaatar is pure zaatar, not mixed with any spices, only including the dried zaatar and the toasted sesame seeds following the traditional Palestinian method. To me, as to most of you, Zaatar is the aroma of childhood memories. 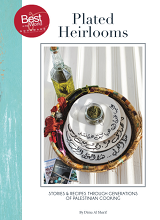 We all had the bowls of zaatar and olive oil on the kitchen table ready to eat any minute. We all had zaatar sandwiches many times in school. We all had Zaatar Manaqish very frequently and we all had zaatar aromatise many of our mothers’ concoctions. I love capturing the aroma of our childhood memories in these jars of uninterrupted zaatar. Just open the jar, close your eyes and smell, and I know it will take you right back to that kitchen! The best thing though is that these women, sit with their daughters who sometimes help them make it. And that is just beautiful as in this culture the mothers and daughters have always helped each other in the making of mooneh and that is exactly how mooneh know-how is passed from generation to the next ensuring continuity. And if that is not what food is about, and if that does not make childhood memories and if that is not soul, and if that is not love, then I don’t know what is! In every part, every thought, and every component, in the product and the process, in the whole circle of women, in my grandmother’s support, in the girl’s help to her mother and her mother’s passing of knowledge to her, in me explaining this to you … it is just pure love all round. And all I ever wish to do is capture all that in every single jar of my products. Since this produce is not locally sourced and therefore is not one supporting the local farmers as my other locally sourced products, it is a DS product that supports a cause. The profit from this Organic Dried Zaatar Mix along with my Limited Edition Organic EVOO will go to support up to 5 single-mother Palestinian families living in the Palestinian Refugee camps in Jordan. Look forward to seeing you every Friday morning suring season (Nov-April) at the farmers’ market at Bay Avenue. 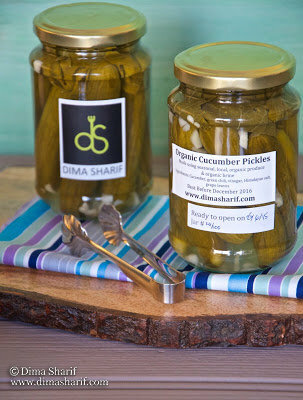 DS Lemon & Chili Pickles.